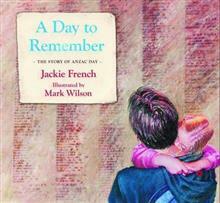 This month we have award-winning author Jackie French, author of 'A Day to Remember' and 200 other books. 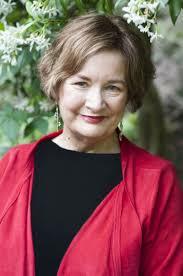 Jackie French was the 2014-2015 Australian Children' Laureate and 2015 Senior Australian of the Year. 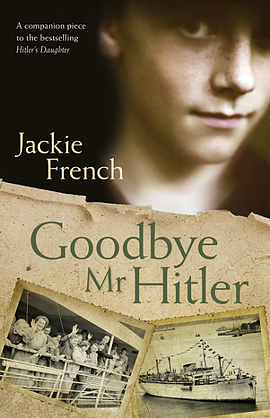 Some of Jackie’s books have sold millions of copies and won over 60 awards in Australia and internationally. "The first Anzac day in 1916 was created to urge more men to feed the war. A Day to Remember is the history of that one day of the year, and how it has changed over almost 100 years. It’s the story of Australia, too. My father in law landed at Anzac Cove, too. He never spoke of it. * Every year he marched, increasingly bitter, with friends unemployed because of the depression, or with lungs or eyes rotted from mustard gas. The marches were mostly men only affairs back then, as were the dawn services, in case crying women disturbed the silence. My childhood saw the battered and weary of World War two, men scarred in body and mind from Japanese prison camps or the Burma railway, the mothers of my friends and my violin teacher, who had survived concentration camps. Boys of my own generation marched away as conscripts to Vietnam, while I walked in anti war demonstrations. As a historian I came up against determinedly uncooperative bureaucracy as I tried to check a list of places where Australian troops have been sent since the 1970’s#. While newspapers talk of Timor, Iraq and Afghanistan, few Australians know our defense forces serve as peacekeepers places like Tonga, Cambodia, Somalia and Rwanda and Haiti. Peace is not easily won, or kept. But many do the best they can. I’ve seen Anzac Day change from the grim faced marchers of my childhood, to the years when it seemed as if Anzac day might vanish except for a dedicated few, or when the Anzac day marchers faced anti conscription demonstrations, and women with placards who demanded the right to march too. In the past two decades our reawakening sense of history has recreated Anzac day yet again. Each year the marches are larger, the commemorations broader. Anzac Day itself has been a catalyst for many people to discover Australian’s history, too. Last Anzac day I stood with friends in Braidwood’s main street. Children marched with their grandparents’ medals. A poodle sat next to us, a sprig of rosemary in its collar. A kid called out ‘Daddy’ as her father passed. Most of us, I think, wept a little as the Last Post played. For some it was a celebration of military tradition. Others in the crowd were pacifists, or felt that Australians shouldn’t be in Afghanistan. It didn’t matter. There are many different memories that make up Anzac day now. We remembered fathers, husbands, aunts, sons, daughters and grandfathers; those who our country sent to war and then forgot, when they returned home damaged; the starving and tortured who struggle towards refugee camps; all who suffer in war, or give their lives to try to make things better. I wrote A Day to Remember because by honoring the suffering and sacrifice of others we find the gift of empathy ourselves. On this one day of the year, it is good to stand together, and remember not just the past, but why we need to remember, too."